Oil price has declined and the US dollar grew against the commodity currencies. 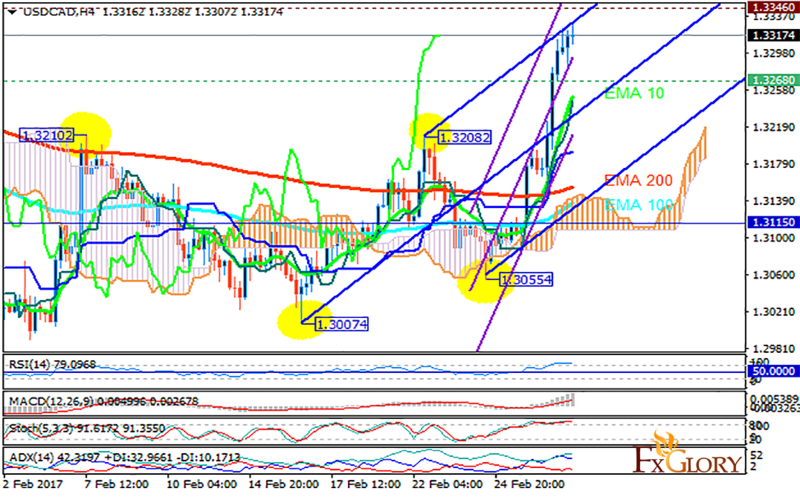 The pair is finding support at 1.32680 with resistance at 1.33460 which both lines are above the weekly pivot point at 1.31150. The EMA of 10 is climbing up the ascendant channel and it is above the EMA of 100 and the EMA of 200. The RSI is moving in overbought area, the MACD indicator is in positive territory and the Stochastic is moving in its high ranges. The ADX is showing strong buy signals. The price is above the Ichimoku Cloud and the Chinkou Span. The Tenkan-sen is showing an upward trend while the Kijun-sen is showing a horizontal trend. The pair is not going to cross the Andrews’ pitchfork and the resistance area; pullbacks will start soon targeting 1.3120.